Why do some mutations cause cancer in some tissues and not others ? 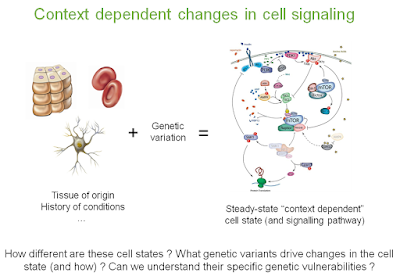 What happens to the cell signalling pathways during differentiation ? Why are some genes essential in some cell types and not others or why are some drugs more effective at killing some cell types than others ? We think that this is a great time to be asking these questions of how the genetic background or tissue of origin changes cell states. More precisely for us, how this re-wires cell signalling. It has become routine to measure changes in phosphorylation across different conditions, including different cancer types. The Sanger and others are establishing panels of human cell lines that are being profiled with an increasing array of omics technologies with drug sensitivity and CRISPR based gene essentiality information. These panels offer a great opportunity to address these questions. 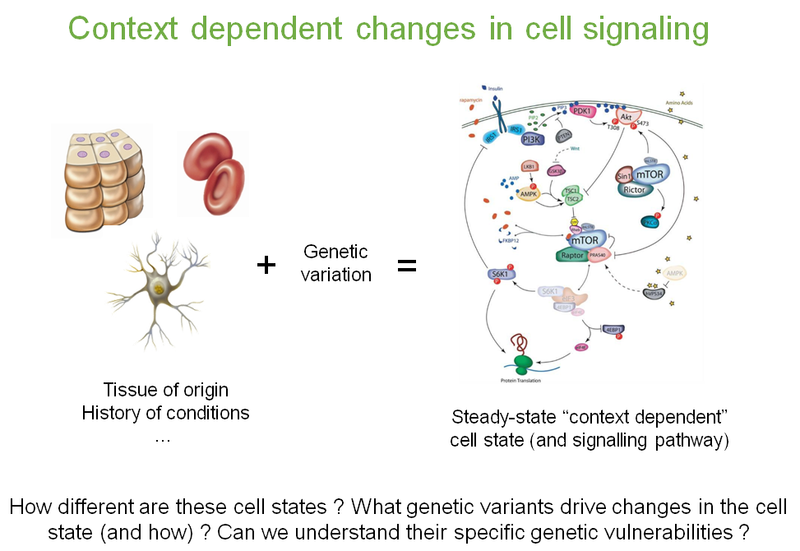 We want to combine the work we have been doing in studying human signalling with phosphoproteomic data, with variant effect predictors, microscopy based studies of cell signalling and network modelling to address this question of context dependent changes in cell signalling. To support this research we have 2 postdoc positions available: one would be primarily computational and would involve image analysis and network modelling in collaboration with microscopy groups (see here for project and application); the second would be primarily experimental with a focus on microscopy. The latter would be available via the ESPOD fellowship scheme in collaboration with Leopold Parts group at Sanger (see here for project description and here to apply). The split between computational and experimental is open and wet/dry mixed candidates are encouraged as well to apply to both. These projects complement existing work in the group using cancer Omics data to study the genetic determinants of changes in protein abundance and phosphorylation and will be in collaboration with work developed by the Petsalaki group at EBI that is also recruiting. Email me if you have any questions/concerns about the positions.